Deceptively simple. This Orange Hot Chocolate tastes just like a Pepperidge Farm’s Orange Milano to me. It’s rich with the mild tanginess of fresh orange. My husband and I participate in a local farm cooperative. Each week we get locally grown produce from Full Circle Farm. Lately, it’s been a lot of citrus – oranges, tangelos, lemons, grapefruit, even pomelos. It takes effort to find uses for all the citrus fruit. You can squeeze and freeze the juice but I wanted to use the fruit since it was so fresh. Thus, the orange hot chocolate was born! And my husband pronounced it his FAVORITE hot chocolate to date. That means a lot. Consider my obsession with hot chocolate – Marshmallow Cream and Salted Caramel. So I hope you enjoy it, too! Garnish with Grand Marnier-spiked whipped cream, orange peel or a slice of orange. Chef’s notes: You can skip the cream if you don’t have any on hand. And this recipe works with any kind of chocolate – your pick! Pour milk and cream into a small saucepan. Zest an orange into long strips with a knife or peeler. Don’t zest too deeply – avoid the white pith too far under the orange skin. Add 1/2 of your orange zest and 1 slice of orange (don’t squeeze) to the milk in your saucepan. Bring the milk to a simmer on medium-low heat, stirring occasionally. Chop your chocolate finely. 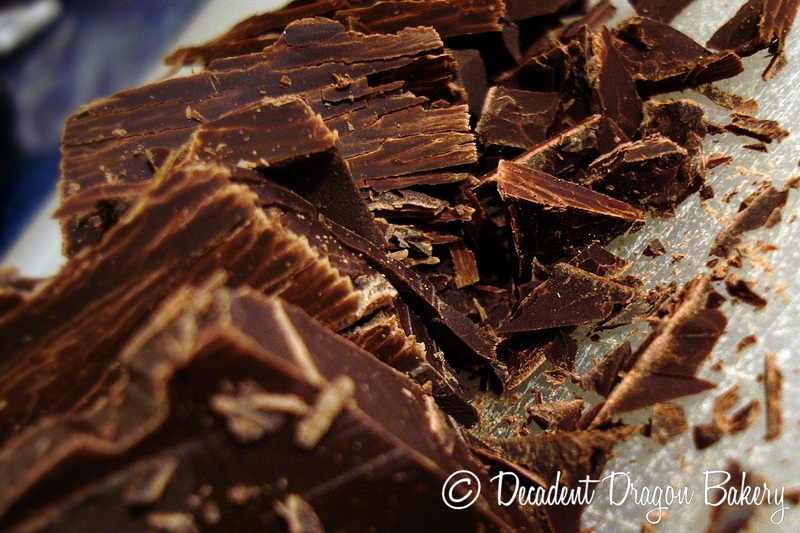 Finely chopped chocolate will dissolve more easily. Once your milk has simmered, remove from the heat and add your chopped chocolate, cocoa powder and pinch of salt. Let sit 1-2 minutes to melt, then stir to combine. Strain your hot chocolate mixture through a fine sieve to remove the orange and any lumps. Garnish with whipped cream, orange peel or a slice of orange. Enjoy! And let me know what you think of this orange hot chocolate. Chocolate, Caramel and Sea Salt are one of those special combinations that really make your taste buds sing. I LOVE this foodie celebrity-couple. 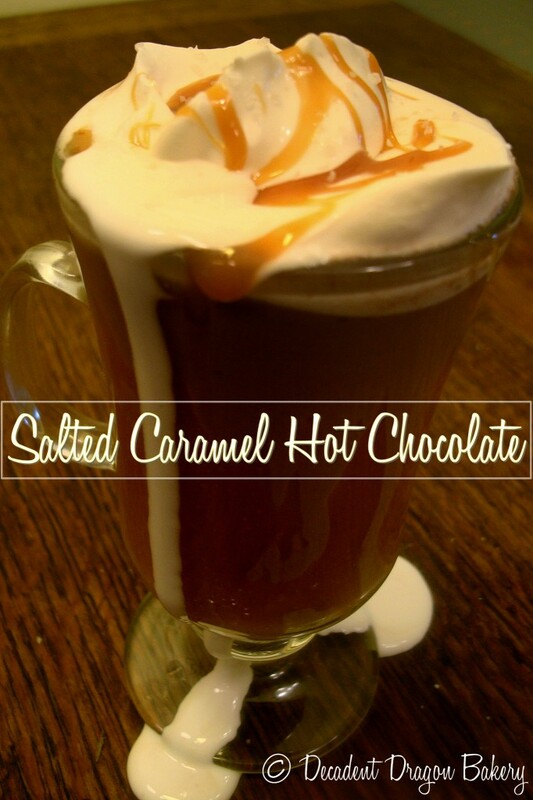 Try this 15 minute recipe for richly decadent Salted Caramel Hot Chocolate. I’m not exactly sure when I jumped on the SALT + CARAMEL bandwagon. But I am “drinking the Kool-Aid,” as a former mentor might say. Recently, I had a wonderful chocolate caramel tart with salted caramel ice cream from The Girl and the Fig in Sonoma, an amazing French restaurant that you MUST try. [Best pork chop of my life, too]. Great quality caramel is a bit salty on its own. Salt brings out the burnt sugar, butter and vanilla-infused flavors. For this drink, you can use whatever caramel you have on-hand. However, if you have the time and inclination, I recommend making it yourself. This Homemade Salted Caramel Sauce from Brown Eyed Baker is a hit. For this drink, I prefer to use high-quality Sea Salt or finishing salt. Table salt is a no-go: too salty on the tongue. The size of each grain of sea salt is bigger but actually less salty on the tongue. Kosher salt or other large-grained salt will do OK as a substitute. In addition to caramel sauce and salt, you will need good quality chocolate. You can make this with plain ‘ol chocolate chips (and it still tastes great) but if you have excellent chocolate it is a transcendent experience. Callebaut or Guittard are great options. 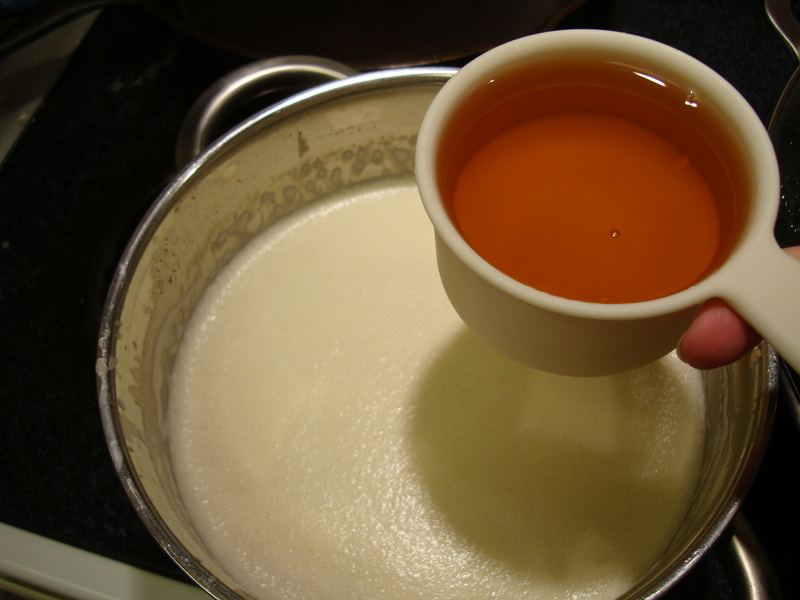 Pour cream into a small saucepan. Bring to gentle simmer on medium heat, scraping the sides of the saucepan with a silicone spatula. If a skin forms on the bottom of the pan, don’t scrape it. Place finely chopped chocolate in a medium glass bowl. Once cream has simmered, pour the cream over the chocolate, add the vanilla extract on top and let it just sit 3-4 minutes. With a spoon, gently stir the mixture until thoroughly combined. There should not be any un-melted chocolate pieces and the ganache should have a shiny sheen. Set aside. In the same saucepan (to save on dishes), heat up one (1) cup of milk on medium heat. When hot but not simmering, remove from heat. Add 4-6 tbsp of the chocolate ganache base to the milk and stir to combine. If cold, heat up your caramel in the microwave until pourable consistency. Grab a serving mug and spoon caramel onto the sides of the inside of the mug. Sprinkle a small pinch of salt (~1/8 tsp) into the bottom and sides of the mug. Pour your hot chocolate mixture into the mug. Top with freshly whipped cream. Spoon caramel over the top and sprinkle lightly with sea salt to taste. P.S. Try this drink with these freshly baked ladyfinger cookies. Or, looking for something else to do with caramel? This recipe for Apple Cider Caramels is flavorful in a completely different way! As you can see, my Salted Caramel Hot Chocolate overflowed with happiness. Perfect for a wintery day! The quintessential holiday beverage. 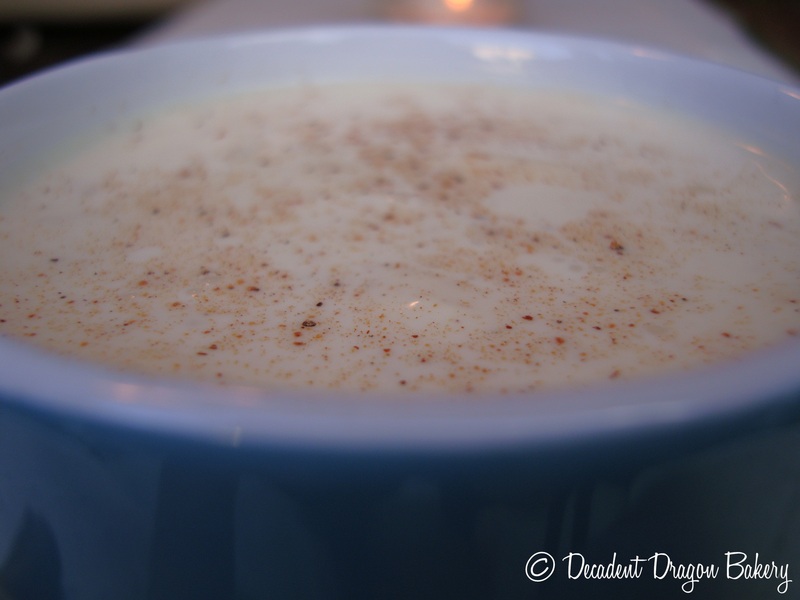 Egg Nog has seen many an amateur cook through endless hours spent slaving over a holiday meal. It’s smoothed the edges on those awkward dinners with the extended family that drag on-and-on. It’s perfect for sipping with friends and family in front of a warm, crackly, fire. I still remember the first time I sampled homemade Egg Nog. My neighbors hosted a holiday cookie swap. I was probably 13 years old. And there was this huge punch bowl of warm Egg Nog. All the adults were doing boring things like talking to each other. So I fixated on the Nog. I must have had at least four cups full. Far more than was polite. But it was just that good, I couldn’t help going back for more. I’ve decided to unofficially call my recipe “Egg Grog” because it’s made with good quality Jamaican rum. [Egg Grog. The more you drink, the more you feel like a pirate.] But names aside, I think you’ll enjoy it. I can’t stand store bought egg nog. To me, it tastes like bubblegum, which I have no interest in drinking. But that’s OK because this is one beverage that’s simple to make, and customize to your tastes, at home. This drink can be served warm or chilled. It’s best the next day, though mine rarely makes it that long. 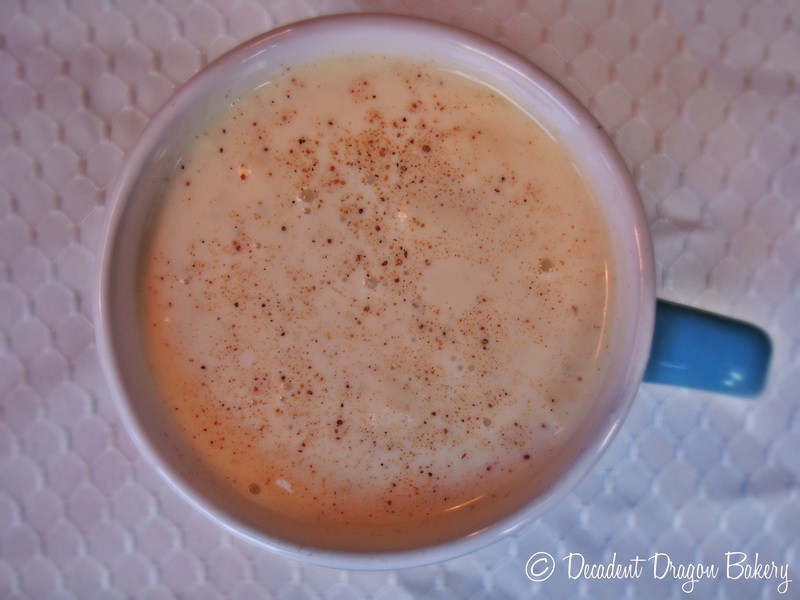 If you haven’t tried homemade Egg Nog before, give this one a try – I promise, you won’t go back! Separate egg yolks from whites. Reserve egg whites for another use. Place yolks in a medium bowl and beat with an electric mixer until egg yolks have lightened in color (about 30 seconds). Slowly add in the sugar, beating until lightened and fluffy (about 2-3 minutes). Combine the milk, cream, nutmeg and salt in a heavy-bottomed saucepan. Slowly heat on medium until the mixture is hot but not boiling. Stir frequently to keep the bottom from burning. Cook on medium heat, stirring frequently with a wooden spoon. You’ll want the mixture to reach 16oF degrees, to ensure the eggs are fully cooked. You can check this with a thermometer, although it’s not required. 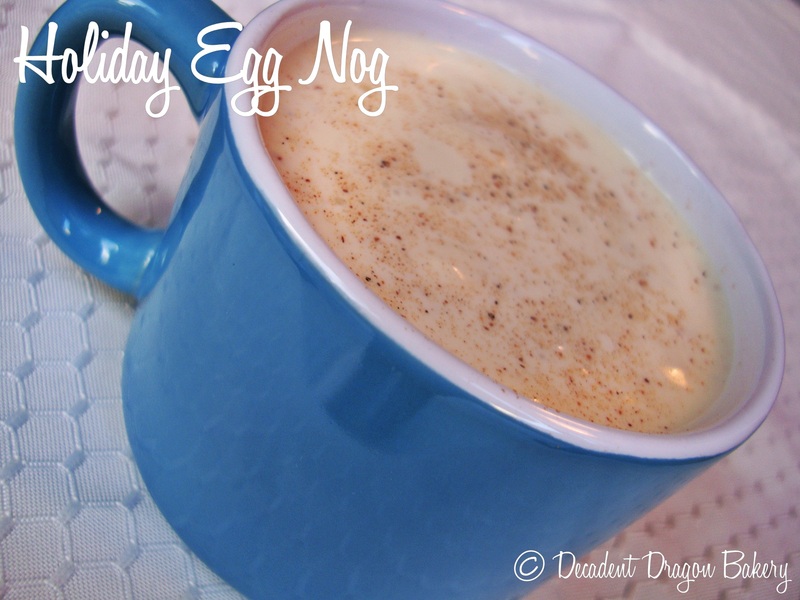 Don’t let the Egg Nog boil. Remove from the heat and add in the rum. Pour into a glass bowl to cool. Once a bit cooler, place into the refrigerator to chill. Enjoy! On a side note, above is a picture of a beautiful bouquet my husband created for me [just because he loves me!]. 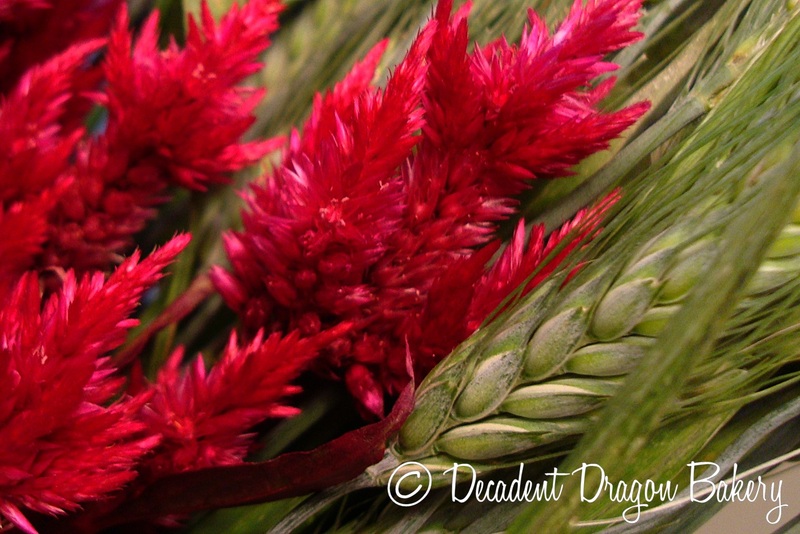 It has fresh wheat and amaranth (pictured), sage, lavendar and rosemary. A perfect bouquet for a chef, no? I’m so lucky! Drinking chocolate is out of this world. The best chocolate beverage you’ll ever have. This version combines locally produced Guittard Chocolate Company’s Bittersweet chocolate with toasted marshmallow cream and the crunch of graham cracker crumbs. Best part? It’s simple to make. Only 10 minutes, I promise. I still remember my first experience with drinking chocolate. In Santa Cruz, there’s a little cafe on Pacific named (quite aptly) Chocolate. They offer a selection of gourmet drinking chocolates made with artisanal chocolate. I fell in love with this decadent beverage one winter evening during college. However, as I sipped my way through their menu, I thought their dark chocolate a smidge too dark and their milk chocolate too light. In true Goldilocks style, I wanted something just right. So I quickly set about recreating this awesome drink for myself. And now you can, too! The chocolate makes (or breaks) this dessert beverage. So, use the best quality chocolate you can find. You get to choose the darkness of the chocolate to suit your taste, however. I highly recommend any of these brands’ semi-sweet or bittersweet chocolate, as I’ve tried them all: Callebaut makes a super-smooth and creamy drink, Schaarfen Berger seems more fruity to me, and Guittard is a great all-around crowd pleaser. Let me give you my recipe! Begin by preparing your chosen glass / mug. Lightly coat the rim of the mug with butter, which will help the graham cracker adhere. If you are using whole graham crackers, smash or blend the crackers into very small pieces / powder. Place crumbs onto a plate, turn the mug upside down and gently coat the rim with the crumbs. Add the vanilla, milk and salt to the melted chocolate mixture. Stir and microwave for 45 seconds. Remove and test the mixture. When done, the drink should be heated to your liking and all chocolate should be fully melted. If not, return and microwave for another 30 seconds. Pour the prepared drinking chocolate into the mug lined with graham cracker crumbs. Place the 1/2 cup of marshmallow cream into a microwave safe bowl. Microwave for 5 seconds, remove and stir. You need the mixture to be pliable enough to spoon over your hot chocolate. Microwave in 5 second increments until the cream is a spoonable consistency. 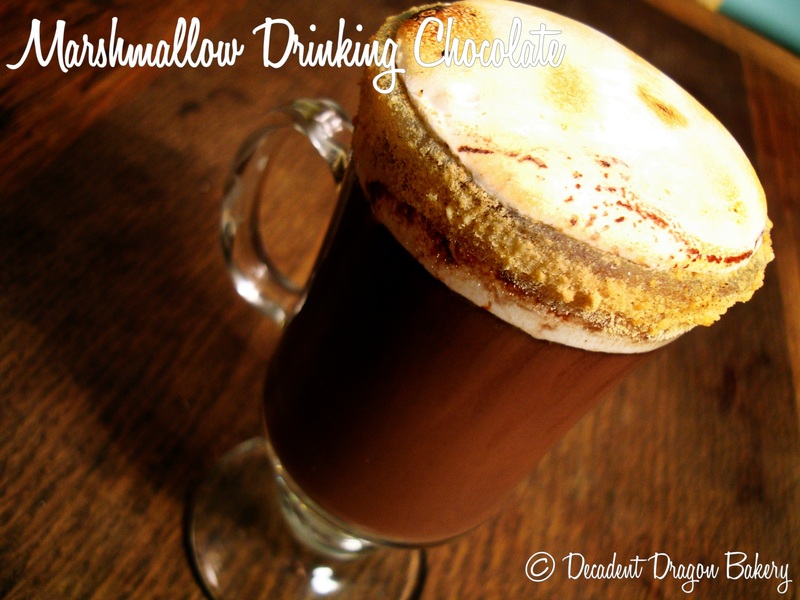 Spoon the marshmallow cream over your drinking chocolate. 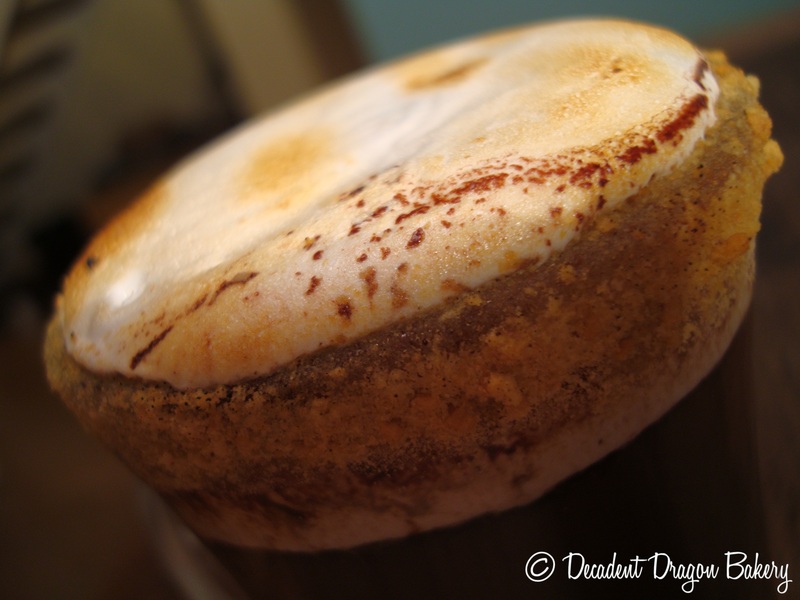 If you have a blowtorch, you can toast the top of the marshmallow cream for effect. Beware the marshmallow cream does like to catch on fire! So keep your blowtorch turned on low and very gently toast the surface. Or, you can pop the mug in your microwave for 10-20 seconds to make the marshmallow cream blow up above the top of the glass! This is not the last time you’ll see drinking chocolate on Decadent Dragon Bakery. It’s just that awesome. Do you have an experience with amazing drinking chocolate? Please share!